As you read through the Consulting Checklist and Scoping document, refer to this example, while preparing your own documents to submit. For this example, we're looking at the Scoping Document for Acme Products Inc.
Mission – To have an efficient reporting CRM solution, that respects Users' permissions based on Roles. Provide Product Specialist (PS) with up-to-date sales data per customer. Filter the Customer List by PS logged in. If PS logged in is not the assigned Rep for a Customer, the Payment and Job Info tab section should be hidden on the Customer List screen. Minimize workload on Product Executive (PE) by making the system more interactive for PS. PE can analyze business trends and focus on increasing productivity. Budget – Our budget range allocated for the customization is $4,000 - $5,000. Timeline – Our aim is to have the system up and running by October 1st. 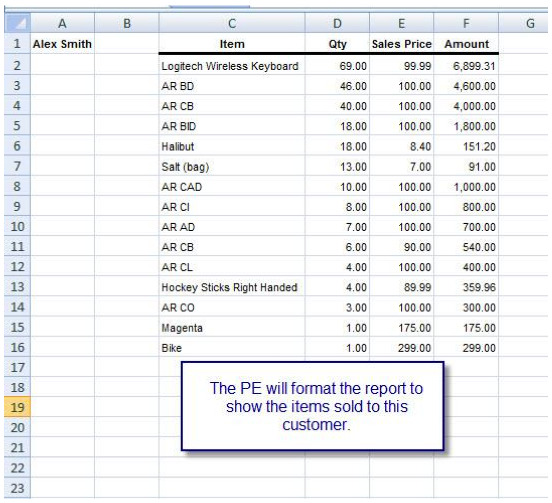 Show a report, displaying the purchase history by Customer within a specified date range. The report should be displayed under a new Tab Section 'Sales Stats' in the Customer List screen. The PE checks Microsoft Outlook for emails received from new leads. 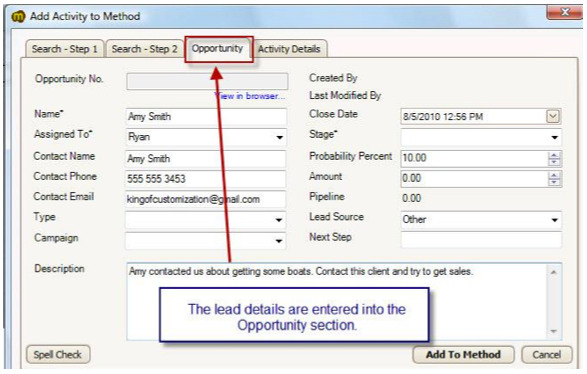 If they receive an email from a lead, they enter it as a Customer in QuickBooks with the Customer Type “Lead”. 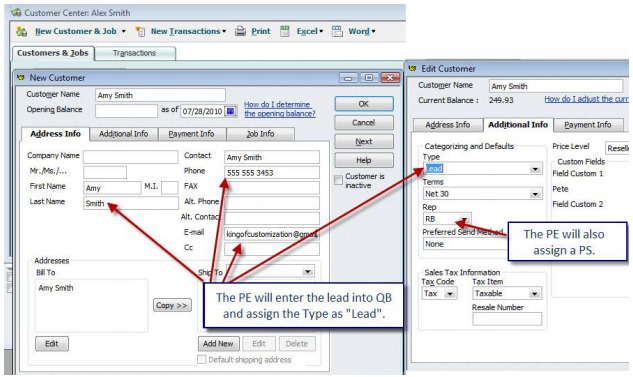 The PE then assigns a PS to that Lead in QuickBooks. They decide which PS will get the next Lead based on the number of Customers they are assigned to. The PS is able to see other PSs Customers, which is a pain point for us. The PS then contacts the Lead and tries to sell them relevant products based on their interests. If the PS is able to close the sale, they create an Invoice in QuickBooks. 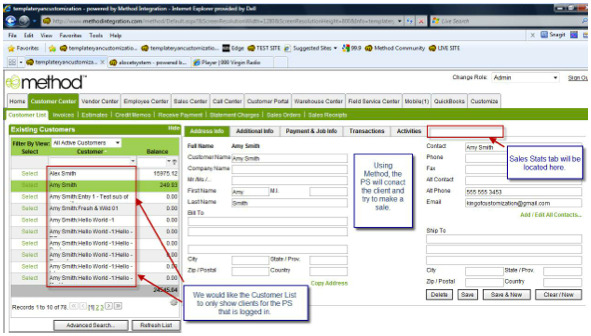 This is another pain point, since they are able to see all Invoices for Customers / Leads in QuickBooks that belong to other PSs. They then update the Notes section in QuickBooks with details from the phone conversation. Finally, they schedule a follow up for 1 month later in their Microsoft Outlook calendar to wrap up the process. If they were unable to close the sale, they would skip the entering Invoice step in QuickBooks and proceed to updating the Notes section in QuickBooks and entering a follow up in Outlook for a month later in their Microsoft Outlook calendar. On the other hand, if the PE doesn't receive any email from Leads, he logs into QuickBooks and runs a 'Sales by Customer Detail' report for existing Customers. They export the report to Microsoft Excel and filter it to show relevant information for their own analysis and for PS to make follow up calls. The PE formats the data and removes any customers that do not belong to that specific PS, as well as any columns that are not needed. 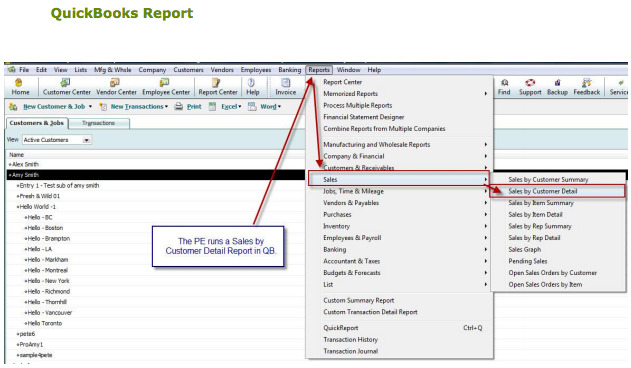 The PE reviews the report to view top items sold by Customer for their own trend analysis. They then assign a follow up call list to the PS by Customer, indicating the least items sold. The PS contacts the Customers and tries to sell the least items sold by Customer. 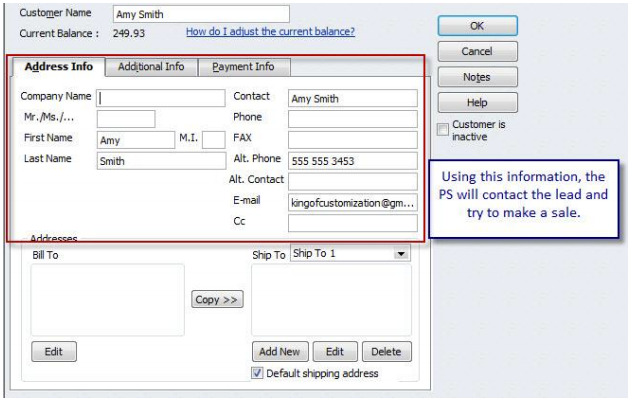 If the PS is able to close the sale, they create an invoice in QuickBooks. They then update the Notes section in QuickBooks with details from the phone conversation. Lastly, they schedule a follow up for 1 month later in their Microsoft Outlook Calendar. If they were unable to close the sale, they would skip the entering Invoice step in QuickBooks and proceed to updating the Notes section in QuickBooks and entering a follow up in Outlook for a month later. A system flowchart, representing the current work flow process as outlined above, is shown below. 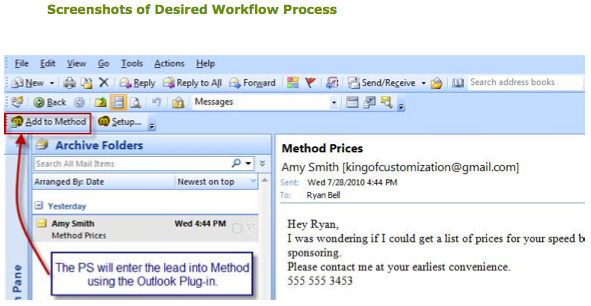 Fig 1.0 – Our process starts off in Microsoft Outlook; this is where the PE will be receiving emails from Leads. The leads are manually entered into QB by the PE. 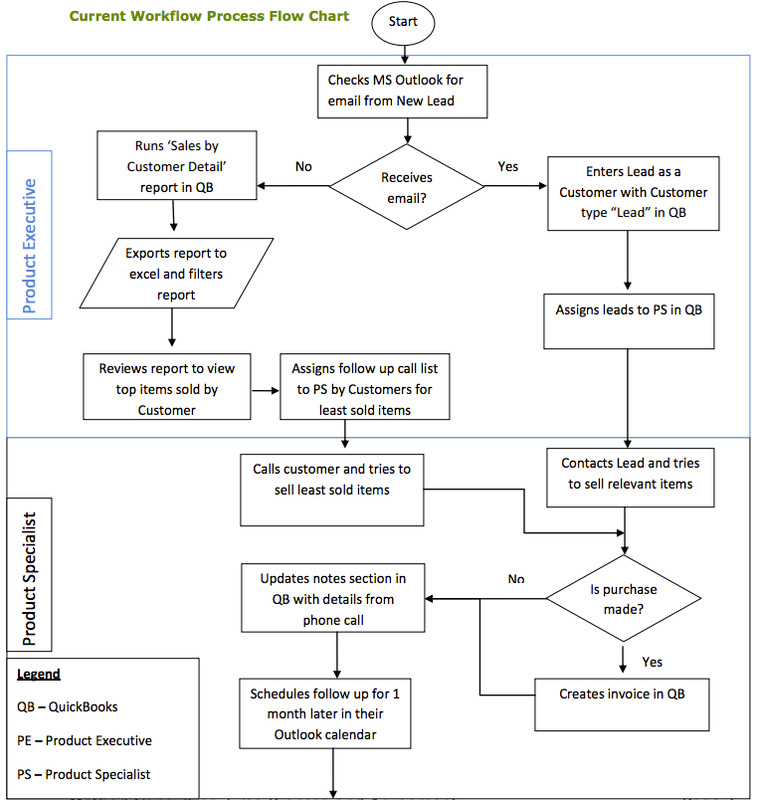 Fig 1.1 – This picture is showing how our PE manually enters in Leads from Outlook. This information is copied/pasted right into QuickBooks. The PE uses the “Type” dropdown to mark the clients as “Lead”. This is also where the PE will assign a PS to the lead. Fig 1.2 – The PS uses the Customer List screen to get detailed customer information. At this point the PS will contact the Lead and try to make a sale. 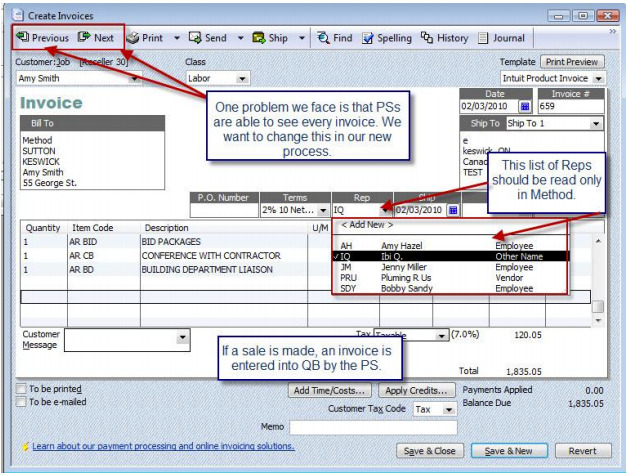 Fig 1.3 – The PS creates an Invoice if they are able to make a sale; this is done directly in QB. We would like to limit access so that PSs are not able to browse all Invoices, but only ones they enter. Fig 1.4 – Our PSs enter notes right into QB each time they call a client. This is the only place we currently keep notes for clients. 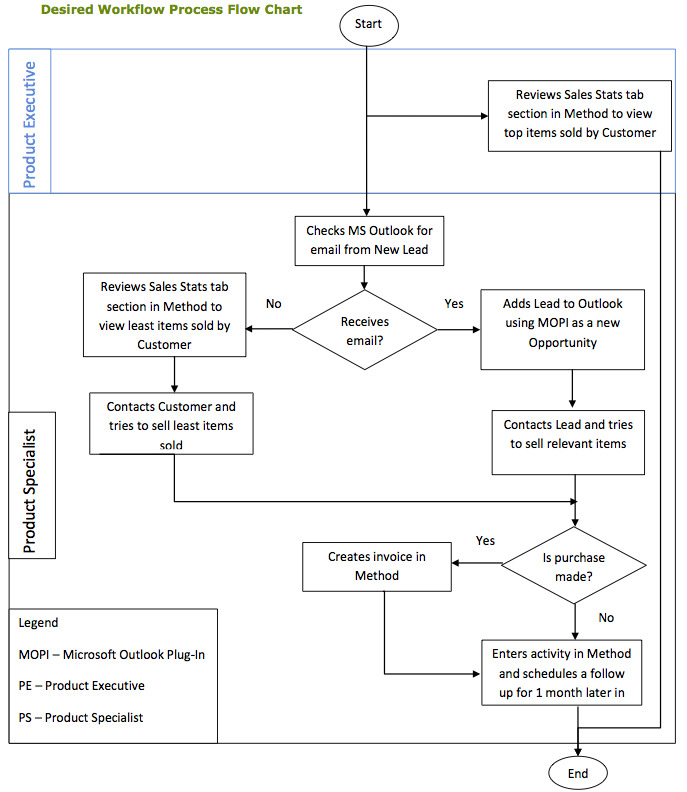 Fig 1.5 – A follow up is then posted into Outlook as a reminder to contact this client. Fig 1.6 – This picture is showing you what report we run in QB. The report is called “Sales by Customer Detail”. Fig 1.7 – Here is what the report looks like in QB. 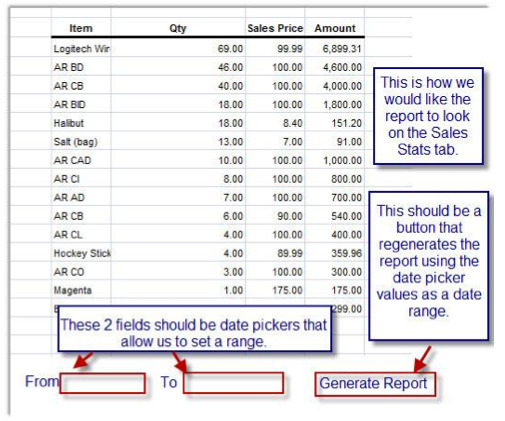 Fig 1.8 – This is what the report looks like in Excel before it is edited, I have highlighted the fields that are kept when formatting the report. Fig 1.9 – This is what the final document looks like when the PE is done formatting it. You can see what Items were purchased, as well as how many of those items were sold. The PS logs into Microsoft Outlook and checks their email for new Leads. 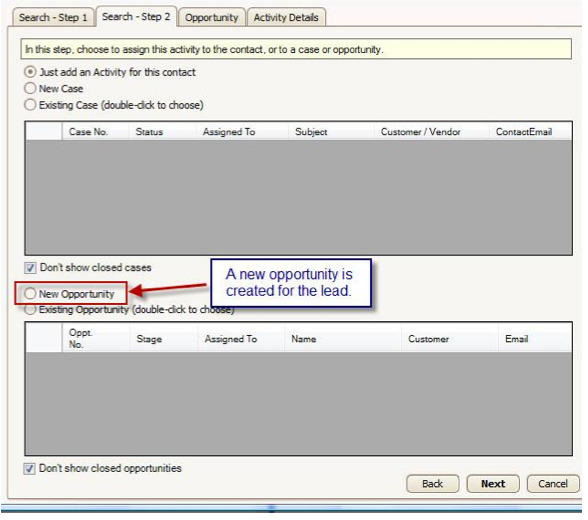 If a new Lead comes in, using the Microsoft Outlook Plug-In (MOPI); the PS will add the Lead as an Opportunity in Method. As emails are received from Leads, the PS should be able to add these prospects as Leads and any communication made with them. This will replace our old process of assigning leads manually, as well as keeping our Leads out of QuickBooks, until they are ready to become an actual customer. The PS then contacts the Leads and tries to sell them relevant products based on their interest. If the PS is able to close the sale, they will then create an invoice in Method. Entering the invoice through Method will prevent them from seeing invoices belonging to other PSs and eliminate them from logging into QuickBooks. This will be done by filtering the existing invoices by PS. 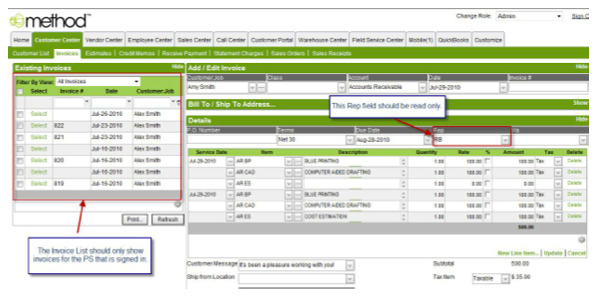 The “Sales Rep” field on the Invoice screen should be read-only, so the PS cannot change the assigned Rep, and it should default to the PS logged in. They should then enter the phone conversation as an activity in Method and immediately schedule a follow up. If no sale is made, they will only enter the phone call and schedule a follow up as Activities in Method. On the other hand, if no Lead comes in, the PS will review the 'Sales Stats' tab section within Method. We would like 'Sales Stats' to be a tab section on the Customer List screen, which generates a report showing items Customers have purchased, within a date range. Method will automatically filter each PS's screen so they will only have access to their own customers' information. This is going to eliminate the PE from having to manually print and hand out reports. The PS will contact the Customers and try to sell least items sold by Customer. If the PS is able to close the sale, they create an Invoice in Method. After creating an Invoice, they will enter their phone call and schedule a follow up in Method using Activities. If no sale is made, then they will skip the creating the Invoice step, and only enter the phone conversation and follow up as Activities in Method. The PEs' only involvement in the new process should be to log into Method and view the 'Sales Stats' tab section under the Customer List screen. They need this for trend analysis. It is important to customize the “ItemService” and “ItemInventory” screens by adding checkboxes. With these checkboxes, we can mark the items that will be included or excluded from the 'Sale Stats' report. This checkbox should be labeled “Include in Sales Report”. A system flowchart, representing the desired workflow process as outlined above, is shown below. 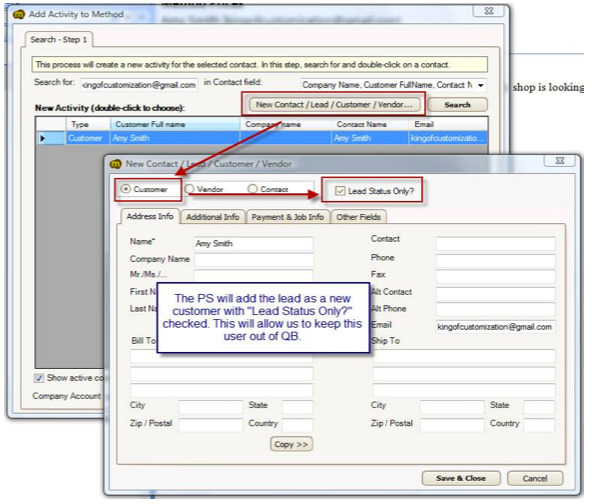 Fig 2.0 – The PS will check Outlook for Leads in the morning. Any Leads found will be added to Method using the Outlook Plug-in. Fig 2.1 – The Lead is added using the Outlook Plug-in and is marked as a 'Lead', this will keep leads out of QB. Fig 2.2 – PSs will select New Opportunity from this screen. Fig 2.3 – This is where we will be entering our details for the Opportunity. Fig 2.4 – The PS would be able to go into Method to review the Lead/Customer information. The Customer List on this screen should be filtered to only show Customers of the PS that is signed into Method. Also if this was a Customer and not a Lead, the PS would review the Sales Stats tab to see the sales history. 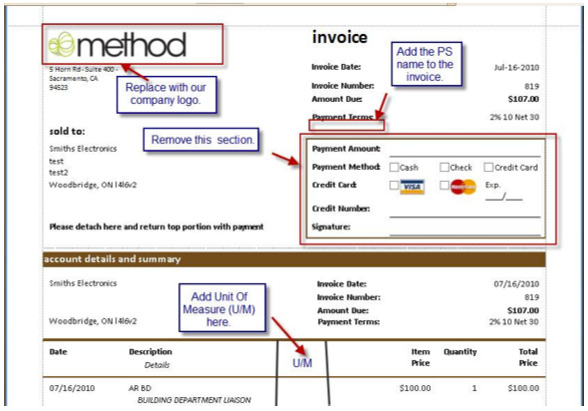 Fig 2.5 – If the PS is able to make a sale, the Invoice will be filled out in Method. Also notice that the invoice list will be filtered to only show Invoices that have been entered by the PS that is signed into Method. Fig 2.6 – An Activity is logged detailing the phone call. Fig 2.7 – A follow up is also created from the same Activity window. 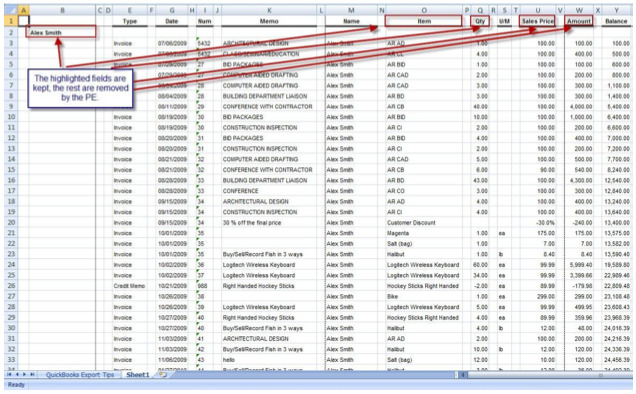 Fig 2.8 – The Items that are displayed in the report are filtered from the Items screen in Method. We would like a checkbox here that is labeled “Include in Sales Report”. If you do not check this box, then this item is excluded from the report that is displayed on the Sales Stats tab on the Customer List. Fig 2.9 – This picture shows how we would like the Sales Stats tab to look. It will be a Tab Section on the Customer List, and will have 2 date pickers that act as a date range. We would like a button that will regenerate the report in case we want to change our date range. Fig 3.0 – Changes to Invoice Print Preview. We would like the existing Invoice report to be customized as well. Above is a picture showing all the changes we require. Lead - A potential Customer interested in our products. Sometimes Prospect is used instead of Lead within our Company. PE (Product Executive) - Product Executives are Managers of Product Specialists. They analyze trends and determine goals of the Company. PS (Product Specialist) - Product Specialists are Sales Representatives that are responsible for contacting Leads / Customers and selling products. Sales Stats (Sales Statistics report) - A tab section on the Customer List screen, displaying a report generated to show a history of items purchased by Customer within a date range. MOPI (Microsoft Outlook Plug-In) - The Microsoft Outlook Plug-In is an integration tool that allows users to sync data between Microsoft Outlook and Method Integration.